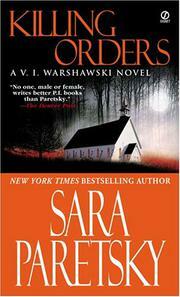 Sara Paretsky brings us her third mystery, Killing Orders, and with it, her tough-girl detective V.I. Warshawski, a kind of grownup Nancy Drew--smart, gutsy, and able to balance thinking with acting. In this novel, Vic responds to a cry for help from her aunt Rosa, a real Tartar who's been fired as treasurer from a local Dominican priory after the monks discover that several million dollars' worth of securities have been substituted with forgeries. Seemingly out of the blue, the truly awful Rosa then tries to fire Vic, but Vic's seen too much to quit (and, anyway, it's family). So Vic persists, and for her trouble a friend is killed, another friend's uncle is stabbed, and Vic herself becomes the target of terror tactics--acid thrown at her in a dark hallway, a mysterious fire in her apartment. It's not so surprising given her opponents: the Mafia, an international financial organization, and the Catholic church. Paretsky creates a believable, sympathetic, nicely developed character and gives us a detailed backdrop, so that we learn enough about Chicago and environs to know where to eat, what expressways to avoid, and which buildings have the finest outdoor art. She is as capable as her detective heroine, weaving in real-life scandals (Sindona and the Franklin National Bank, Roberto Calvi and the Banco Ambrosiano) to validate her plot. No mystery buff will mind the fact that Paretsky doesn't break new ground. She gives us a classic mystery, a page-turner in the best tradition.